Hello, I'm back again with my recent skin care routine. 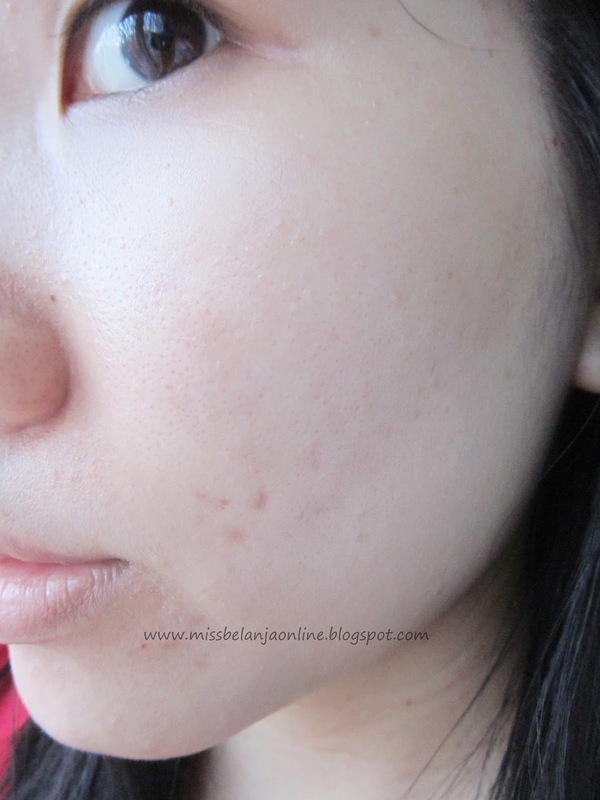 Not long ago I write a post about how frustrated I am about my acne problems. 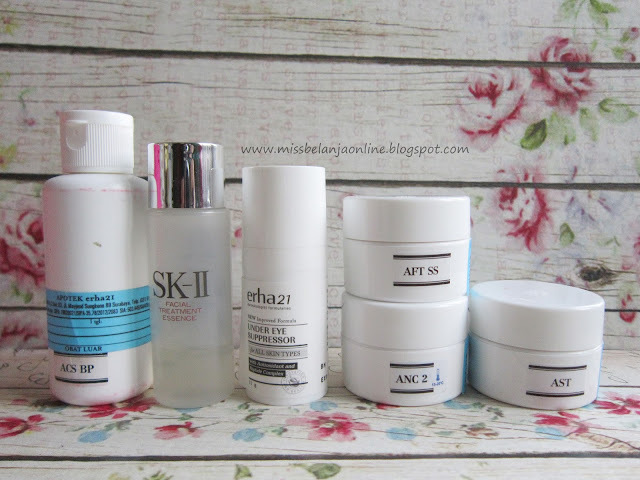 After that I have a chance to try skin care products from beauty clinic ( I never tried cream from beauty clinic before nor trying treatment at beauty clinic. Usually I only doing facial at beauty clinic and It also very seldom) and also I change my usual brand skin care with a new one. Except that, one of my BFF also suggest me to try her skin care brand because she already feel the good result from that products. So, here are my skin care routine now. I wash my face with Erha ACS BP. It contains scrub so I only use a little. As I mentioned before, I can't really take scrub products. 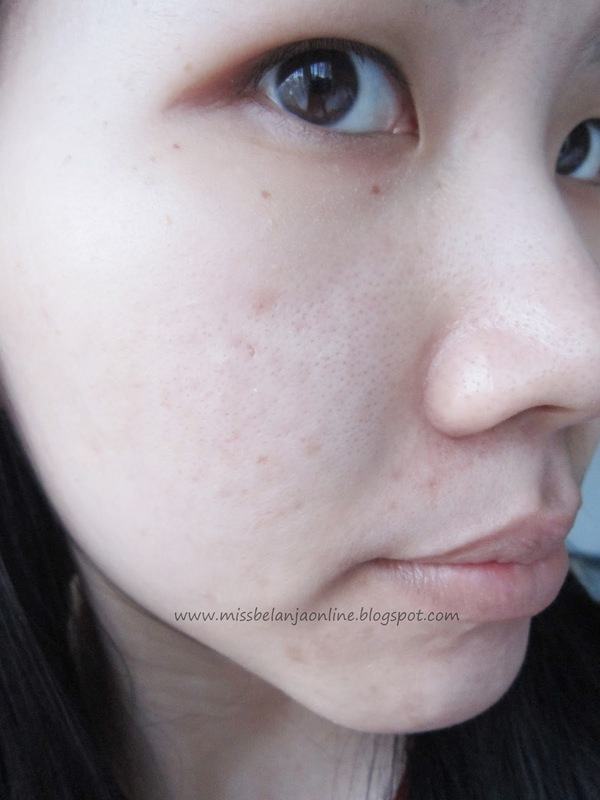 Long ago, I used scrub facial wash and ended having many new pimples on my face. Glad this one is the exception, this is my second bottles and so far I don't have any complaints. After that, I use SKII Faciat Treatment Essence. Pour it a little on my hand and gently pat it all over my face. Next I use moisturizer from Erha (AMG and AF 4) and then I'm ready to go. I don't use make up or powder when I go to office, I only use makeup during weekend hehehe. After I came back from office, I clean my face first with Bioderma (sorry forgot to took picture of it), and then wash my face with Kiehls Blue Herbal Cleansing Gel. I don't use BP because I want to minimaze the use of scrub. Even though it works perfectly on my skin, I'm still a little afraid to used it 3 times a day. That's why I used Kiehls instead of BP. 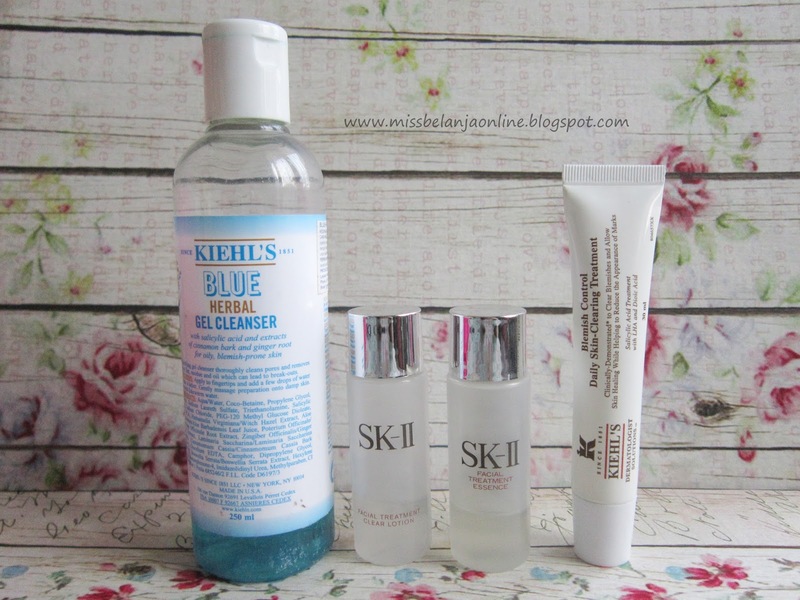 Next, I use SKII Skin Clear Lotion as a toner then use SKII FTE again. After that I use Kiehls Dermatologist Solution Acne Blemish Control Daily Skin Clearing Treatment. 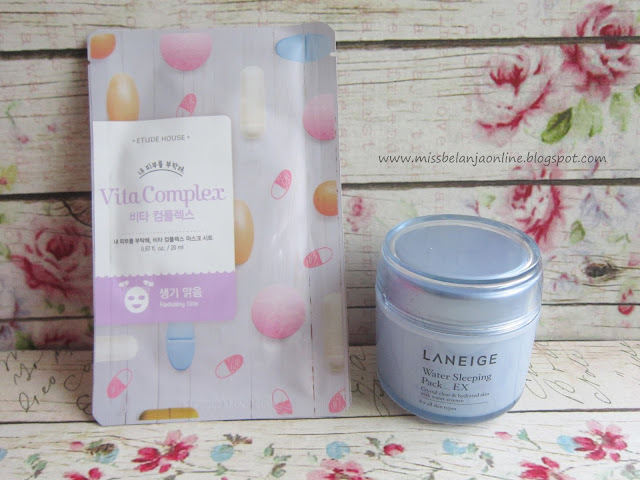 I used Laneige Water Bank Sleeping Ex on Saturday night. When I apply this sleeping pack, I skip my night routine. Also usually 2/3 times a week I use mask sheet (from various brands). The most problem that I have so far, is my skin become very dry and flaky. When It becomes like that, I will stop using Erha and only use Kiehls or stop Kiehls and only use Erha (because those two are quite strong and tend to make skin dry). But it is only at first, and lately I don't have any problem with that combination. 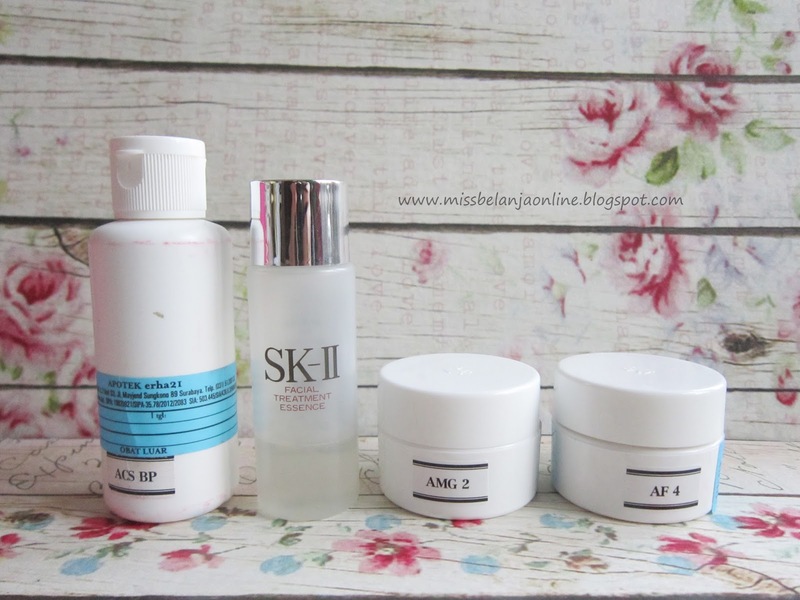 The SKII is the latest addition (suggestion from my BFF), the price is very expensive but I think it really worth the price. The FTE is the best seller product from SKII and It can solve many skin problem that's why I decided to try it and yes it really works for me. Skin become soft and not rough like before. The travel size like mine is 30 ml and I bought it around IDR 200K. It can last for 2 months. I used it 2-3 times a day. As for the Laneige Water Bank Sleeping Ex, I've already write full review about this product on separate post. So far, I can say it helps to moisturize skin, makes skin supple, and make small pimples dry faster. Another question that I also got from my friends is this one: Is it okay to use beauty clinic cream? What happened if you stop? Do you get addicted to it? Do your skin condition become worse again? Again my answer for this question is depends. For me, I did try to stop using Erha cream after 2 months. I stop for almost 2 weeks because I ran out the creams and still had no time to repurchase. During that time, I only use Kiehls (facial wash, toner, acne treatment and moisturizer from blue herbal series and the acne blemish control) and I don't think I got addicted to Erha. I mean, everything is fine even if I stop using it. My skin condition is still the same and not become worse. Also when I went to bali for 1 week (last month) I didn't brought my Erha cream (because the night cream need to be stored in the chiller and I think the steps are to complicated to applied during holiday). I only use the BP facial wash, SKII FTE and Kiehls Acne Blemish. And my skin condition still good like before. Usually when I came back from holiday (or during holiday) my skin condition tends to become very bad (rough and acnes everywhere) but this time it isn't. Some of my friends said about this "addicted" things (not only for Erha, but also another beauty clinic brands outside there) but fortunately for me it doesn't happen. I have this opinion, again this is my OPINION: maybe because I mix a lot of brands, that's why I'm not addicted to 1 brand. If I stop 1 it will not makes my skin condition become very bad or worse. But again, I have a very thick skin to start with (according to my mom hahaha) so the best answer I can give you is, it is depends on your skin condition. That's all my post for today~ sorry for the long post, I bet you all bored with a lot of words. I'm just in the mood of typing today hehehehe. LOL, I love how your eye cream is called an "under eye suppressor." Really nice post.. Aku sering banget denger kalo uda biasa pake krim perawatan dokter gitu bikin ketagihan.. ternyata ngga semua orang ngalamin gitu.. :) thx for the great information..